Perfect for families and friends who like to paddle together, nothing can beat our Mazowe. The Mazowe will forever change your perception of what a double sit-on-top is actually capable of. This kayak, carrying two people and their gear, can really move! Its hull is designed to reduce drag, maintain a straight course and respond quickly to paddle strokes to change direction. The Mazowe’s most valuable feature is that there is a substantial distance between the seats of the front and rear paddlers to give the rear paddler enough space for a full paddle stroke without worrying that their paddle will hit the front paddler. 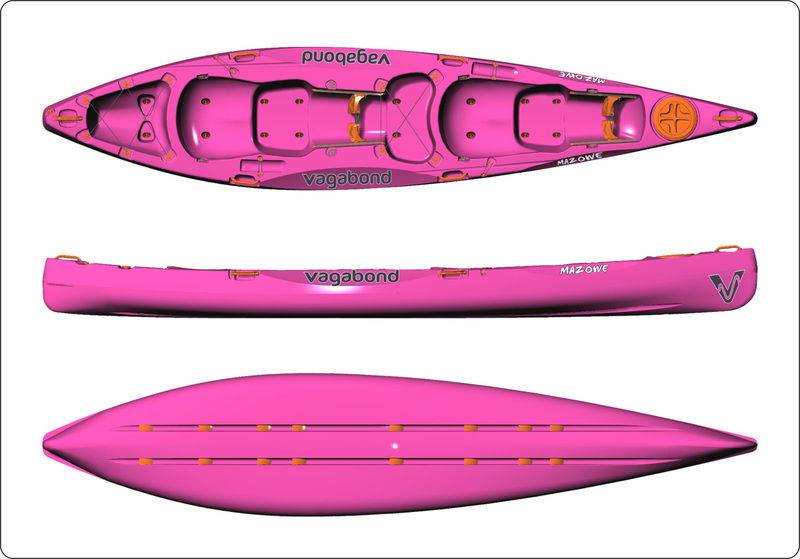 Paddle cutaways – for both paddlers – mean that both can enjoy a full paddle stroke without clipping the paddle blade against the deck. The Mazowe is designed to carry two people with their gear stowed on the deck. That’s why we’ve got a sizeable Tankwell behind the rear paddler and we’ve let the footwell of the rear paddler flow into another tankwell in the middle of the boat to maximise the available storage space. Multifits around the tankwells serve as attachment points for tie-downs, bungee cords, ropes and clips to strap-down gear on the deck. The 8″ Screw Hatch at the front is watertight and it is ideal for items that need to be stowed away more securely. Each paddler also has a Paddle Rest, to secure their paddle to the deck when hands are needed, as well as Bottle Holders. Where double sit-on-top kayaks are concerned, the Mazowe is a game changer.